Cameroon separatist leader, 46 others extradited from Nigeria – Royal Times of Nigeria. Leader of the anglophone separatist movement in Cameroon, Sisiku Ayuk Tabe, was extradited to Yaounde on Monday after being detained in Nigeria. Cameroonian government spokesman Issa Tchiroma Bakary in a statement said, Ayuk Tabe, who had been held in Abuja with 46 of his supporters since January 5, was sent to Cameroon. Tchiroma said, “A group of 47 terrorists, which includes Mr Ayuk Tabe, has been in the hands of the Cameroonian justice system for a few hours,”. 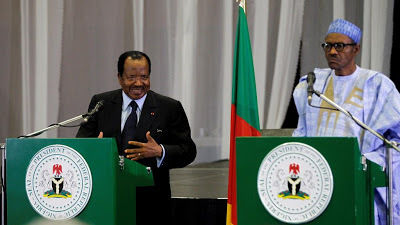 “The determination of Nigeria and Cameroon never to tolerate that their territories serve as a base for destabilising activities directed against one or the other”. In mid-January, Amnesty International expressed concern about the separatists detained in Nigeria, saying they could be threatened with torture and (given) an unfair trial if they are extradited from Nigeria. Over the past year, there has been mounting tension in Cameroon’s Southwest and Northwest regions – home to anglophones who account for about a fifth of the West African nation’s population of 23 million.